COURT LEWIS resides on 12 acres of mixed pasture and woodland, 1,900 foot elevation, near Unicoi, Tennesseee, within Cherokee National Forest. 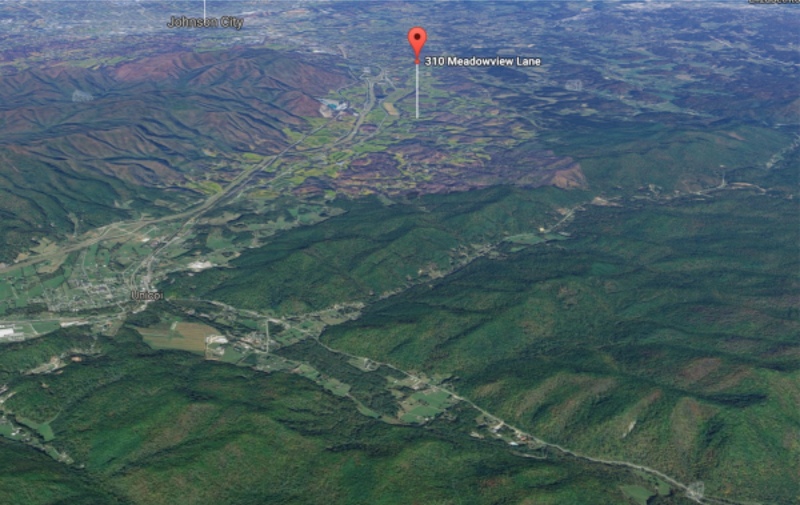 One part of the property has a steep ravine, forested on both sides, with clay-loam soil. The dominant canopy tree species are tuliptree, oak, locust, dogwoods, white pine, and hemlock. He first received seeds from Torreya Guardians autumn 2015. Court Lewis received his first set of seeds in November 2015. 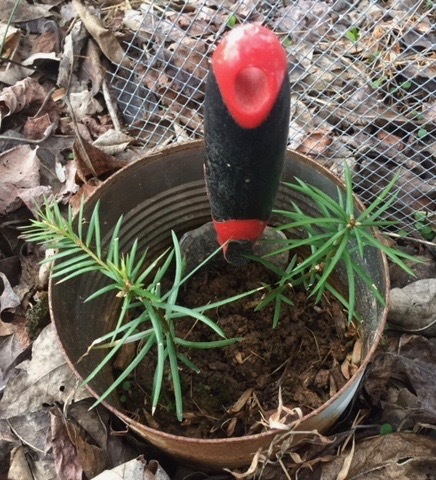 He decided to use the can technique (with bottom of can removed), as suggested by Jack Johnston on the Torreya Guardians propagate page. He planted his seeds January 9, 2016. "I buried the cans about 2/3 in the ground, with the top third above-ground and with a hardware-cloth metal screen over it to protect the shoot while also giving it room to grow. The bottoms of the cans were cut out. The soil in the pots was at surrounding ground level. The seeds were about 2-3 inches below the surface, so they got whatever rain and groundwater the surrounding plants did." Photos LEFT by Court show his final stages of planting. Read his detailed methodology (with more photos) here in PDF. 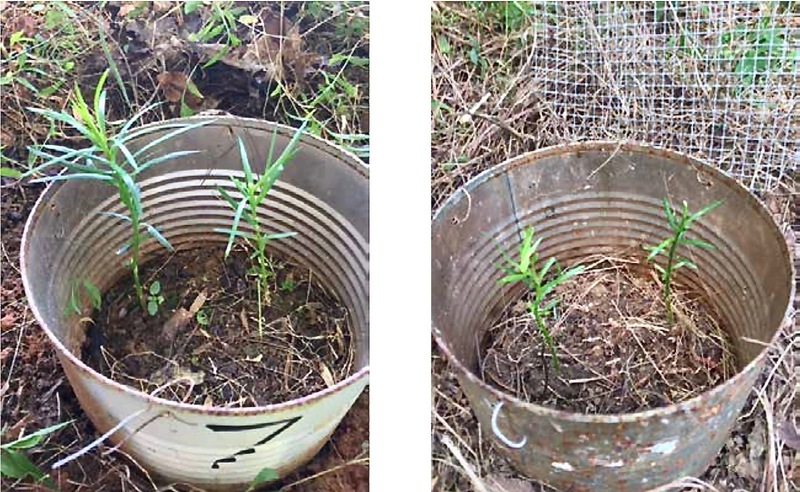 He planted 2 seeds per can  one scarified and the other not. His results will help us evaluate the benefits of scarification. 30 seeds were planted in this fashion, 2 per can. "Five additional seeds are planted without cans  but 5 inches deep, well below the frost zone, so it will be interesting if they show different results from the other 30 (and whether rodents can detect them at that depth)." • MARCH 29, 2016 - I planted nearly 50 seeds. We had 3 periods of subzero temps in Jan-Feb. It'll be interesting to see if scarification makes a difference. At least with my cans [protected by wire on top], I know the seeds are still in the ground and not eaten. 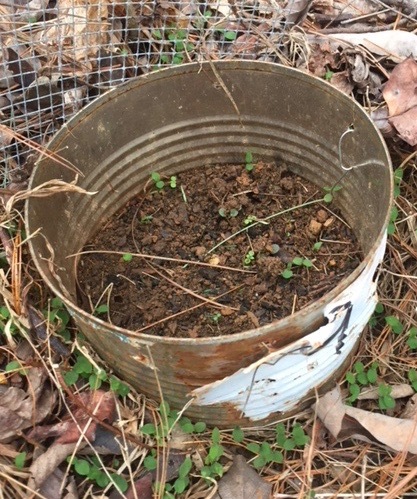 • NOVEMBER 14, 2016 - I've checked on a number of my seed pots recently and none have sprouted so far. (It's been about a year.) I dug up one seed and it looked about like it did when I planted it. But we had a drought this summer and fall, and since nearly all are a little hard to get to, I didn't water them. I'm sure that didn't help. Anyway, that's my status report. • MAY 2017 - Lee Barnes sent him 50 more seeds from the fall 2016 harvest in Medford, OR. • MAY 23, 2017 - Nothing so far. It's been about 18 months, but a lot of that was very dry. The pots are too far from the house and too hard to get to for me to water them. But I would hope I'd get at least one! • JUNE 11, 2017 - I was weed-eating yesterday in one of the areas where I had planted my pots back in early January 2016. The pots were totally covered in weeds. But lo and behold, when I dug them out, there were bright green Torreya seedlings bumping up against the bottom of the wire mesh covers. So I checked them all (data below). Photos left are two of the buried pots (each with 2 seeds in it). I was lucky to look for them when I did, because they were just hitting the wire mesh; a few had grown a little bit through it but the mesh could be removed without damaging the sprout. INITIAL CONDITIONS: Of the 18 buried cans, 12 had two seeds planted and 6 had one seed planted. Of the 12 pairs, 8 cans had one scarified seed and one not scarified. JUNE RESULTS: 16 of the 18 cans had at least one seedling. I could not access one can; it was buried under a recently fallen tree and covered with poison ivy vines and other debris. In 3 of the 12 cans with two seeds, both had sprouted. Out of the other 9 cans (one of these was the one I couldn't find), where only one had sprouted so far, of the two where I could see the seeds, both were the scarified seeds. FREE-PLANTING (directly into ground) RESULTS: I also had planted 4 seeds directly into the soil, 5 inches deep, with no pot and no wire screen (marked with flags). None of those have sprouted so far. At one marked site I found a clear vole hole. So I have a total of 18 healthy seedlings. 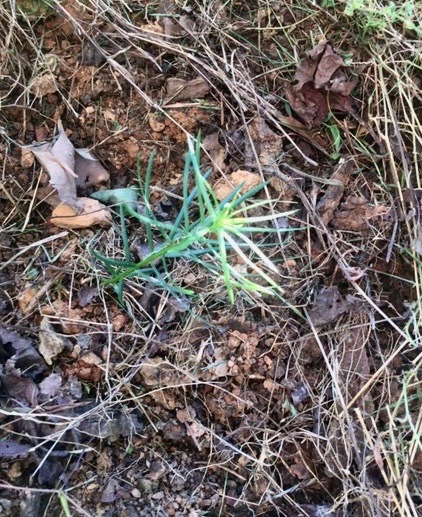 PHOTOS of ALL OF THE SEEDLINGS are shown in this pdf of photos. We're getting enough rain. I cleared out the ground cover around each pot and removed the wire mesh. • JUNE 29 & JULY 5, 2017 - This past winter was freakishly warm here. Maybe got into the low teens once or twice. Many days in the 60s and 70s. One decent snowfall, in early November I recall. So maybe it was just enough to give them the cold cycle they need, but not enough to kill the shallow roots as the seeds started to sprout in the warm periods. 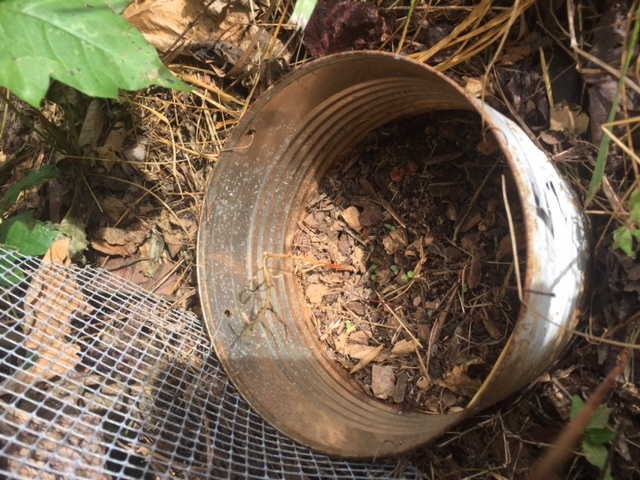 PHOTOS LEFT: After I removed the cover of weeds from the cans and took off the wire mesh cover so they could continue growing, we had a dry, hot spell. 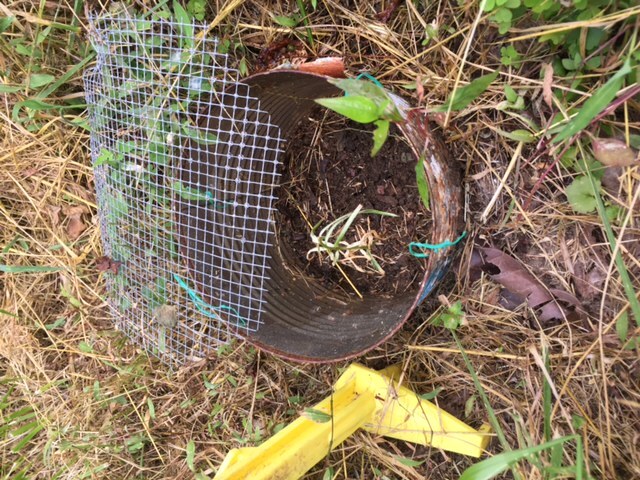 Three of the seedlings were burned by the sun and dry weather after being uncovered and died. (They were the ones in pots that were most exposed to the full sun all day long.) So I have a total of 16 healthy seedlings. None of the free-planted seeds have come up yet, that I can see. 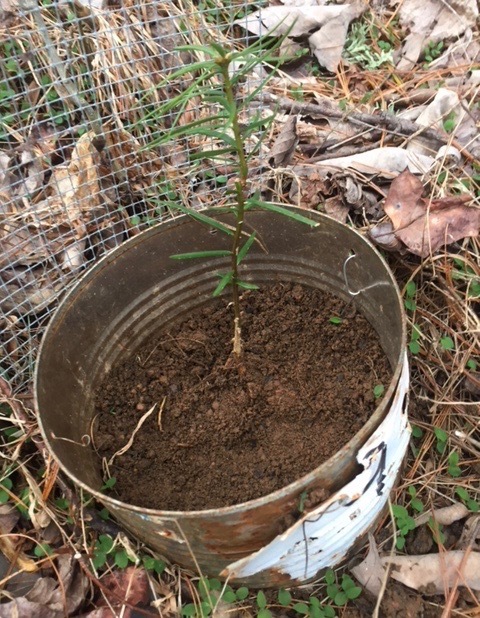 Editor's note re sunburn: Torreya taxifolia is a slow-growing evergreen tree. Its needles will be used for photosynthesis for 3 or more years before dropping off. Because the tree furnishes each leaf with UV-sun protection chemicals that match the conditions of its first season, the existing leaves will sunburn (and sometimes die) if substantially more sun enters the site in subsequent years. Bottom line: Ensure that the seed germinates in conditions not unlike those in which it will ultimately be placed. Consult the Shade Or Sun? section of our "Propagate" page. • JULY 31, 2017 - Important result: Seed planted 5 inches deep produces seedling. I had begun to think that the 4 seeds I had planted without protecting cans had been eaten or were too deep. But they've just started coming up. I had them at 5 inches deep compared to 1-2 inches in the rodent-protected cans, so it just took them longer. Also, lately we've been having heavy rains, after a long dry period. 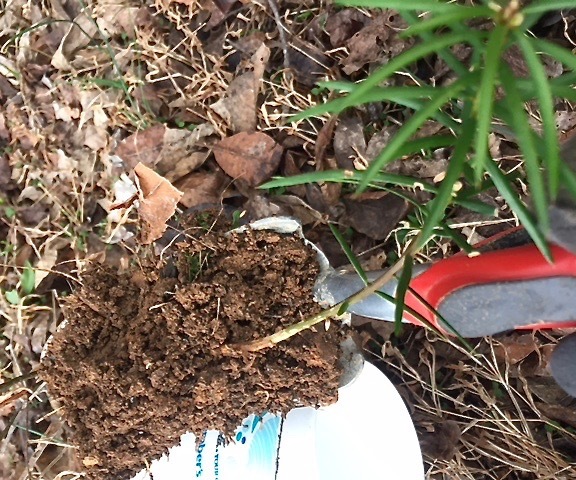 Torreya seems to like our orange clay-rich soil in East Tennessee. The one (photo left) that has above-ground growth is in the sunniest location, less surrounded by weed overgrowth than the others. • Court received seeds in the fall of 2015, from the harvest that year. 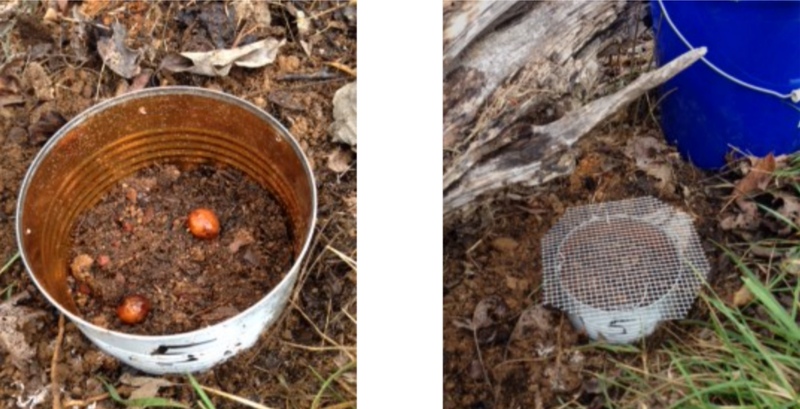 • I began advocating in 2015 for seed planters to experiment with out-planting seeds directly into final locations in forest habitat, unprotected, except for testing whether 5 or 6 inches deep might be adequate for preventing rodents from detecting them, while still allowing the germinating seeds to rise up to the sunlight. This is the first report of successful experimental results for free-planting seeds at great depth (5 inches). • AUGUST 1, 2017 - I used a 50/50 mixture of native clay soil (from the hole in which I was planting the seeds) and Scott's topsoil as the planting medium, so culture shock shouldn't be a problem. Counting 7 no-shows in a can, one lost can, two killed by a deer stepping into the can, 3 dying of sun/drought, and 3 deep-plantings that haven't surfaced yet, I have 17 healthy seedlings out of 34 seeds planted  a 50% success rate (so far). • SEPTEMBER 18, 2017 - Two of the cans with no-shows each produced a late-appearing seedling. As well, of the 2 seedlings that appeared to have died of sun-scald this past spring, one had regnerated. Hardy little bugger! So now I have 20 seedlings. In the one can where the seedling had really died, I planted 2 new seeds at a depth of 2 inches, since it has a covering to guard against rodents. Update on the seed-depth experiment: A total of 4 seeds were planted 5-inches deep; of these only 1 shows above-ground growth thus far. We've had a long dry spell, and seeing that Lee had packed the seeds he sent me this past spring in wet moss, I left them in the box until it got cooler. 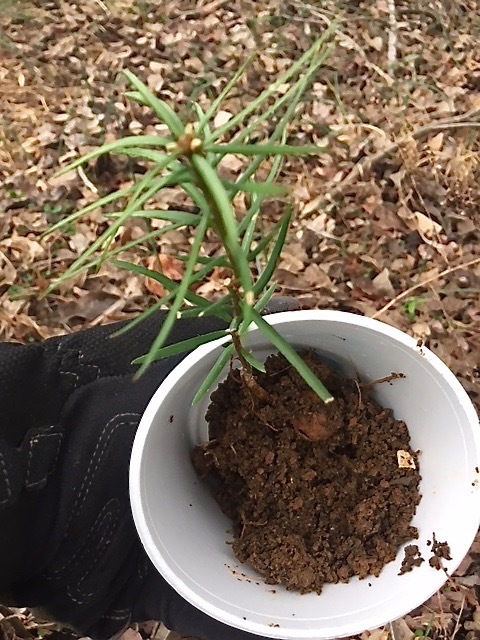 I just planted them this weekend  not in cans this time, but 3 to 5 inches deep in many varied locations directly into the forest, marked with a flag. I'll check them starting next spring. • APRIL 2, 2018 - This weekend I transplanted three seedlings that were growing two-to-a-pot into three cans where none had sprouted. 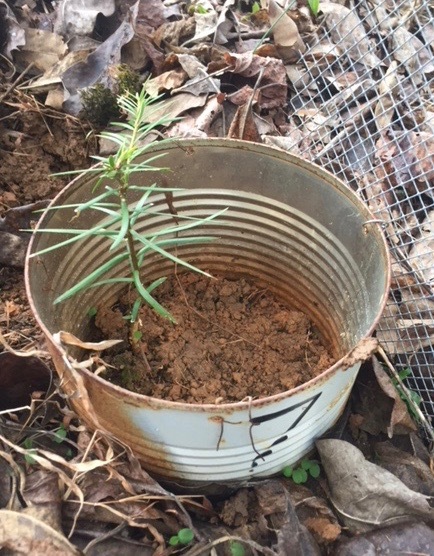 The bottoms of the cans are cut out and the roots are growing several inches into the regular soil, in a variety of places in the woods. The photos show the transition of one from can #7 to can #9. I'll keep an eye on them and see how they do. They were planted in December 2015 and sprouted a year ago. They're all about 4 to 6 inches high now. Growing slowly, despite plenty of rain. • JUNE 2, 2018 - The young ones growing in bottomless cans in the woods are doing well. 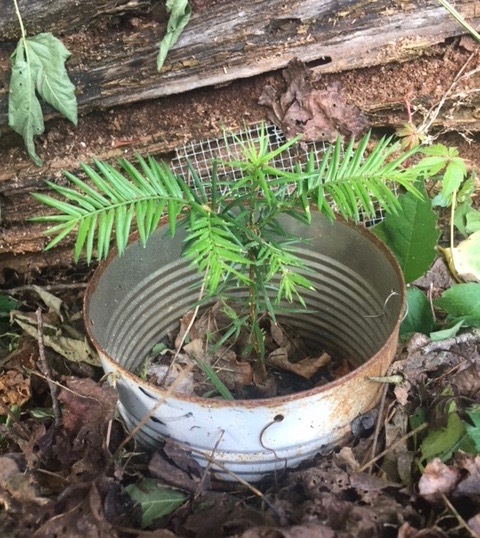 I transplanted several from cans where there were two-to-a-can, where none had sprouted, or they had died from drought or from being stepped on by deer. Meanwhile we've had rain nearly every day for a month, so they're thriving and some of those I thought had died have experienced resurrection and life. Here's a photo of one of the best-growing ones from this morning. None of the seeds I planted at different depths in the ground in September have sprouted yet, as far as I know. But they're getting covered by weeds and ground cover, unlike the ones in the cans, which are protected to a great extent by the cans. • SEPTEMBER 24 UPDATE: "... I currently have 21 seedlings (not 17), due to some late bloomers since that tally was made."